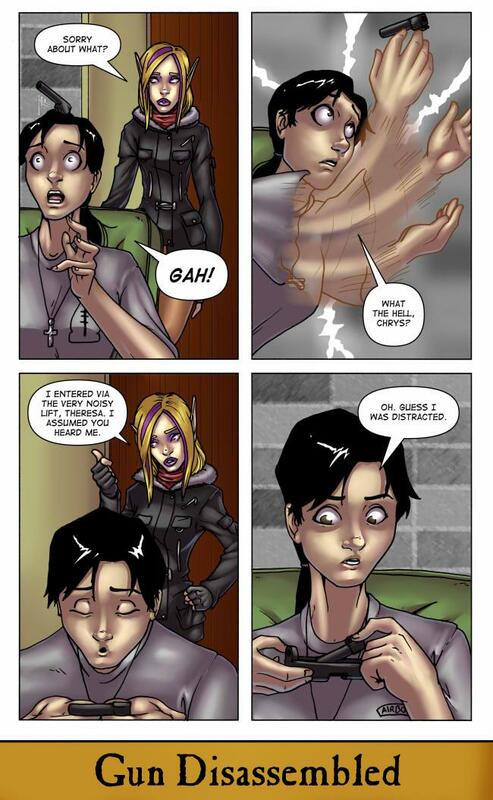 People were guessing as to why Theresa was sorry in the previous page. Apologizing, specifically, to her father. Some guessed it might be because there was a problem with the gun. For some people, guns are like cars - if you don't take supreme care of them you bring dishonor on yourself and your family. Theresa's gun is not cracked or broken and just needs a proper cleaning. Which is why she is sorry. Because Theresa hasn't cleaned her gun since she shot Ruby. She couldn't bear to look at it. Now she has to because the practical - knowing she might need it - overcomes the repulsion - worrying she might have to take another life. Theresa's at the point many reach when they enter active combat for the first time. Something police officers and soldiers all have to deal with. It is one thing to know, in the abstract, that you are trained to take another's life under the right circumstances. It is another to actually do it. If you've ever watched the show Flashpoint, I think they handled this very well.